Startup Imanox, with funding from the European Social Fund (ESF) in Germany [initial EXIST Grant: EUR 117.000,00]. Startup HelloCoach, with funding from the European Social Fund (ESF) in Germany [initial ESF and Federal State Berlin Grant: EUR 27.000,00]. Startup Nuzzera, with funding from the European Social Fund (ESF) in Germany [initial ESF and Federal State Berlin Grant: EUR 18.000,00]. Startup Book One, with funding from the European Social Fund (ESF) in Germany [initial ESF and Federal State Berlin Grant: EUR 18.000,00]. Startup Wavy, with funding from the European Social Fund (ESF) in Germany [initial ESF and Federal State Berlin Grant: EUR 18.000,00]. Since 2011: Mohammed Almashraee (from Yemen). Cooperative PhD between the Corporate Semantic Web Group, Computer Science Dept., Freie Universität Berlin, Germany, and the Computer Science Dept., Department of Cooperative Studies, Berlin School of Economics and Law, Germany. Thema: On Solving Real Optimization Problems Using Pareto-based Multi-objective Evolutionary Algorithms. Doctoral candidate: Antonio López Márquez, Higher Engineering School, Universidad de Almería, Spain. Thema: Web Conscious Distributed Indexing Algorithm for Scalable Information Retrieval. Doctoral candidate: Palson Kennedy, R., Department of Computer Science and Engineering, Faculty of Information and Communication Engineering, Anna University, Chennai, India. I supervise about 10 (+/- 2) Bachelor theses every year and since 2010 at the Computer Science Dept. from the Berlin School of Economics and Law (In German: HWR Berlin). HWR undergraduate students are matriculated in a special cooperative program that combines full-time classroom study at the HWR with regular practical on-the-job trainings at business enterprises. The topics of their Bachelor theses are always related to the latest techonologies and corporate projects from the companies they work at. Isn't it fantastic! I am honoured to co-supervise students' theses from companies like Bayer, Helmholtz-Zentrum Berlin (HZB), Fraunhofer-Verbund IuK-Technologie, Deutsche Post IT Services GmbH, Berliner Stadtreinigung (BSR), TELES AG, ARC-Greenlab GmbH, microTOOL GmbH, MSA AUER GmbH, DB Systel GmbH, Toll Collect GmbH, ]init[ AG, data experts GmbH, Projektron GmbH, Landesbank Berlin AG, Wilhelm Reuss GmbH & Co. KG, OPITZ CONSULTING Hamburg GmbH, IT Service Omikron GmbH, H&H Datenverarbeitungs- und Beratungsgesellschaft mbH, and Aastra Deutschland GmbH (now Mitel) among others. 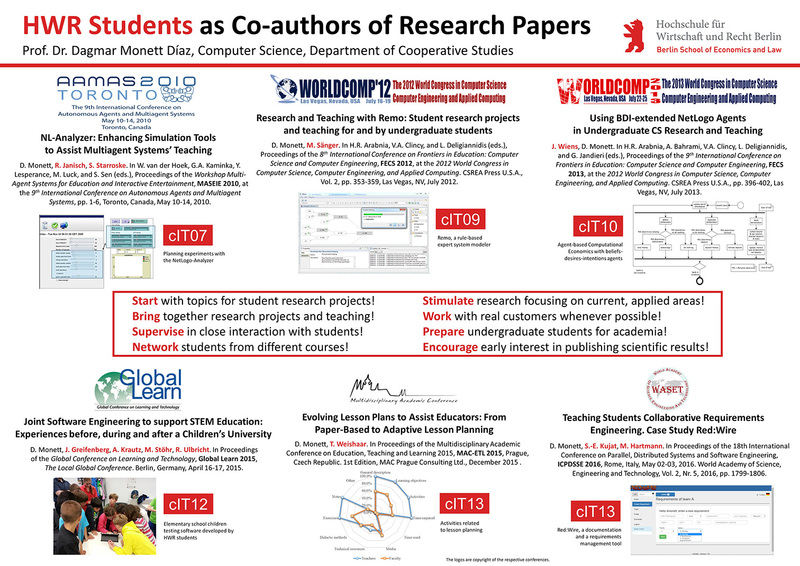 I also have the great opportunity to select topics for student research projects at the Computer Science Dept. from the Berlin School of Economics and Law. The topics of the research projects I supervise are mainly related to my research interests.